Killer Characters: What's a Mother to Do? 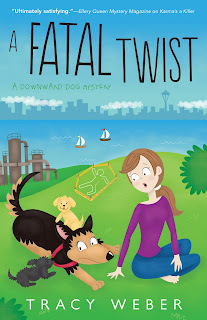 By Bella of Tracy Weber’s Downward Dog Mystery Series. It’s hard to be a mother. Especially with twins. Especially when they’re young. Especially when they’re rambunctious. Especially when they’re not yours, and you never wanted kids to begin with. 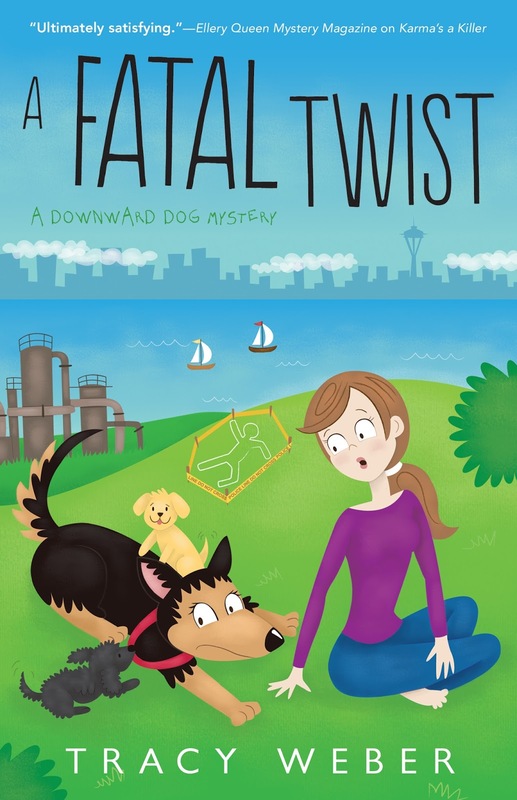 But what’s a dog supposed to do? Michael, my male human, showed up with a bag of Chinese food and a box containing the two six-week-old troublemakers three days ago. I don’t know what he was thinking. He knows I don’t like other dogs getting in my business, or at least he should know it. I yell at every dog that gets within five feet of me. I didn’t want to accept these two on my territory, either, but they’re so young and vulnerable. I just couldn’t bring myself to scare them away. So instead, I gave them both a bath, curled up with them to keep them warm, and promised them I’d keep them safe. By the very next day, they owned me. The steal my toys, tug on my ears, and pounce on my face. Michael and Kate (by female human) lock them up in a cage when they leave the house, which seems like a great idea on the surface. At least if the fur-demons are locked up, I won’t have to wear razor-sharp, puppy-teeth earrings. But as soon as Michael and Kate leave, the puppies start howling. You’d think they were being slaughtered. It hurts my ears. I try to calm them down, but it’s no use. The puppies aren’t frightened; they’re angry. How DARE they be contained! But like I said, what’s a dog to do? I can’t tell them off, they’re too darned cute. So I do what mothers do everywhere. Sleep when they sleep and dream dreamy dreams of the day they grow up and leave home. Then again, look at them over there. Little labradoodles, one black, one golden, curled up in an almost-perfect Yin/Yang symbol. Life without them might be kind of lonely. Oh no! Mutt’s eyes are open, and she’s looking at me! Here she comes, bounding across the living room carpet. Ouch, you little monster! Let go of my tail! I mean it! You’ll wake your brother! I have twin boys (though 19 now) and I have to say that my fur babies gave me a more run for my money. Have a great day! Twin boys! Bella says that she loves kids! Bella, I understand completely. You have my sympathy - and I am jealous of all the fun you are having. Bell can't wait until her babies get older!